Did you know that the craft and hobby industry generates nearly $50 billion annually in the U.S. alone? Or, that 55.8% of U.S. households are actively involved in crafting? Moreover, 11% of hobbyists and crafters purchase their supplies online and that number will almost certainly increase. The December 2014 Industry Market Research Report for Fabric, Craft & Sewing Supplies Stores in the US reports that their “industry is slowly rebounding from recessionary lows. Improvement in consumer confidence and an anticipated increase in disposable income has helped industry revenue grow, and an increased interest in do-it-yourself (DIY) fashion has encouraged consumers to purchase more fabric and craft supplies”. In October of 2014, the Craft & Hobby Association added a new blogger membership type to its Industry Professional category. This membership allows professional bloggers to enjoy all of the CHA membership benefit offerings and get free admission to the CHA 2015 MEGA Show, membership in CHA’s Social Media Section, a subscription to Craft Industry Today magazine and discounts on education programs and services. Should YOU Blog about Hobbies and Crafts? According to a 2012 study by the Craft & Hobby Association (CHA), scrapbooking, card making and paper crafting are the most practiced crafts, with 23 million people, or 10% of the U.S. population, participating. This is followed by painting, calligraphy, drawing and print making (21 million, or 9%); cake and food decorating (18.8 million, or 8%); and fabric and sewing crafting (18.7 million, or 8%). The same study reports that women are more likely to be crafters in all categories, whereas men are more likely to participate in ready-to-decorate wood crafts (38%); sculpture, pottery and glass crafting (37%); and painting, drawing, calligraphy and printmaking (33%). Cross-Stitch, Embroidery, Needlepoint, Needle Felting, etc. Children’s Crafts – tie-dye crafts have re-emerged with the development of less complicated techniques and kits, making the process simple for anyone. Mixed Media – collage continues to grow with the continued popularity of the Gelli Plate, a product that has crossed into every niche of the art and craft market. Paper Crafts – wood veneer cut-outs are rising in popularity and may be seen in many designer collections. Needle Arts – embroidery is at the forefront of needlework trends this year. Jewelry Trends – ear jewelry is a focus right now with ear cuffs, ear jackets, ear crawlers, and faux piercings all making a comeback. 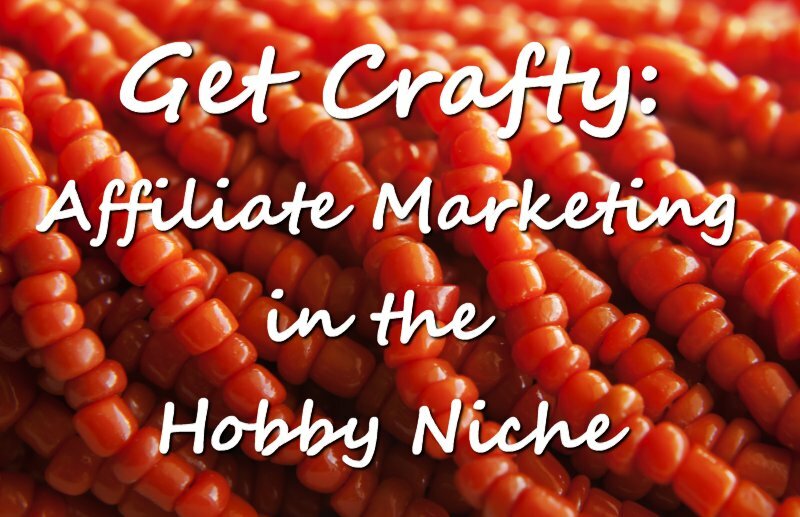 Here are some ideas for products (and merchants) in the hobby niche that you can sell as an affiliate. Merchants – CJ Affiliate lists 90 merchants in their Art/Photo/Music category and Clickbank lists 119 products under the Home & Garden / Arts & Crafts section. Patterns & Plans – Check out Ted McGrath’s 16,000 woodworking plans offered on Clickbank for an example of a product which sells amazing well… It has a gravity of 111.35. Crafting Supplies – Big brand-name craft suppliers like Jo-Ann, Michael’s and CreateforLess (all available through CJ) are great stores to get ideas for products to sell. Note that commissions for these merchants are 4%, 6% and 7% respectively. Magazine Subscriptions – The NPG Group reported that almost one half of hobbyists purchase or subscribe to craft/hobby related magazines and newsletters. My search for ‘craft magazines’ under ‘Magazine Subscriptions’ resulted in 172 different craft magazines on Amazon. Video Tutorials – LeisureArts, which is on the Shareasale affiliate network and lists 2,834 products in their datafeed, is a leading publisher of lifestyle and instructional craft publications which include ebooks, digital downloads, DVDs and video publications. Private Label Rights (to buy or sell) – IDPLR offers 9 different products that reference scrapbooking alone. Other topics include woodworking, sewing, knitting and jewelry… and those are just the topics I searched for. Has your interest in the hobby and craft niche been piqued? Comments, questions or suggestions? Please leave a comment below! This article was so helpful! Thank you so much for taking the time to put this together. You rock! Monna, having made a living in the quilting world for decades (birthed and grew an online video network, QNNtv.com, hosted and host many shows, 35 books, HSN presenter, etc. ) I can attest to the fact that quilting is alive and well! Long story short quilting brought me to my present business: designing and importing cuckoo clocks. It all happened because we were shooting a show in Germany and I finagled doing an episode at a cuckoo clock factory. The result was a Quilt Shop Cuckoo Clock. I come at this from the perspective of an advertiser. In fact I have just launched my own affiliate program. I started selling my clocks through Kickstarter, which was very successful. But I needed a way to advertise the clocks through bloggers and quilt shops. That’s where my customers are! After a lot of research I decided to create my own affiliate marketing program. I felt that I know and have access to potential affiliates. Perhaps later on, when the new clocks that are in the works come on line, I’ll want publishers to find me more readily. But for now, I know the quilting world, so this is my route. I’ve just launched it, reaching out to some bloggers to test it, and am about to send invitations to a list of quilt shops. From my perspective an affiliate relationship is the perfect way to advertise. Can’t wait to see how it turns out! It is an topic and very important information, I have a blog but has been a problem mediocrity from me, although come to have some fans have not given the boost it needs, I bought your book some years ago, but until today I’m back to the issue and really want to get involved has to blog seriously. Haha I told you I was green. Yes I understand thank you! I guess I just need to dive right in and just do it. I love all kinds of crafting. I did have a scrapbooking site at one time but that was before the Google “animal” updates hit and I just never took the extra effort to keep it going. I am really surprised that quilting was not on your list but maybe it’s not as popular as it used to be. I’m getting nowhere with my efforts here. Exactly what are you offering here, “learn how to market.”? I have a plan, recently, to begin selling my crafts on Etsy. Which Is my first love, and I’ve been told over and over that I have real talent. You might be interested in this article, which explains 12 ways to make money online, including affiliate marketing. Thank you so much for this post! I have followed your posts for many years but I don’t think I’ve ever left a comment before. You are truly an awesome lady. I have a knitting website that has unfortunately been sitting for a year and half due to some serious setbacks in my personal life. Now that I am recovering, albeit very slowly, it’s time to keep moving forward and I am interested in finding ways to monetize it as well as get up and running on Facebook. While I understand the funadamentals of monetizing I’m really not sure how to implement them on my website. Facebook has been kind of a black hole for me…haha. Honestly? I am totally green. While I have my FB page setup I’m not sure how to go about making posts and linking the posts to my website and so on. What’s the proper way of going about it? I would really appreciate any thoughts or suggestions you may have Ros. Thanks for sharing and I’m glad to hear that you are recovering from your setbacks. Re ‘making posts and linking the posts to my website’ (from Facebook) — you want to do that the other way around. Post to your website and then place a link back to the article on your Facebook page. That way you attract visitors to your site to read the whole article. You’ll see that’s what I do on my own Facebook page. I just wish I’d new how to make money with it online – I wouldn’t know where or how to start. Thanks for sharing. This is something I will be looking into in the near future. Thanks for stopping by and leaving your thoughts. I look forward to hearing how you do in the arts and crafts niche!